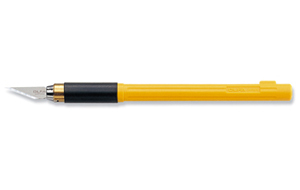 OLFA Blades KB Model 9161 Are An Ideal General Purpose Art Blade. 25 blades per pack. CLICK ON IMAGE AND SCROLL DOWN TO RELATED PRODUCTS FOR A LIST OF CUTTERS OR KNIVES THESE BLADES WILL FIT. 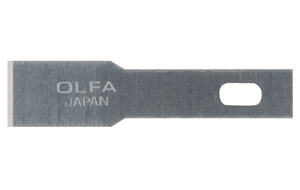 OLFA Blades KB4-F/5 Model 9166 Are Chisel Replacement Blades. 5 blades per pack. CLICK ON IMAGE AND SCROLL DOWN TO RELATED PRODUCTS FOR A LIST OF CUTTERS OR KNIVES THESE BLADES WILL FIT. 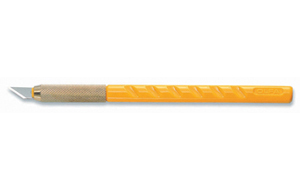 OLFA Blades KB4-NS/3 Model 9169 Are Narrow Saw Blade Replacement Blades. 3 blades per pack. CLICK ON IMAGE AND SCROLL DOWN TO RELATED PRODUCTS FOR A LIST OF CUTTERS OR KNIVES THESE BLADES WILL FIT. 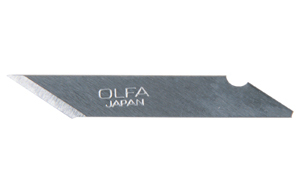 OLFA Blades KB4-R/5 Model 9165 Are Curved Carving Replacement Blades. 5 blades per pack. CLICK ON IMAGE AND SCROLL DOWN TO RELATED PRODUCTS FOR A LIST OF CUTTERS OR KNIVES THESE BLADES WILL FIT. 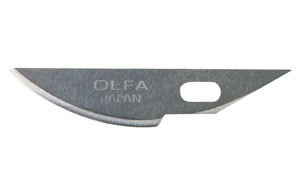 OLFA Blades KB-4/S Model 1107451 Are Precision Replacement Blades. 100 blades per Bulk Pack. 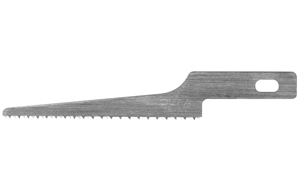 CLICK ON IMAGE AND SCROLL DOWN TO RELATED PRODUCTS FOR A LIST OF CUTTERS OR KNIVES THESE BLADES WILL FIT. 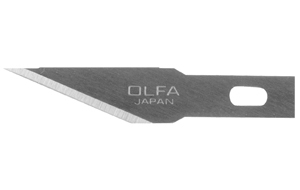 OLFA Blades KB4-S/5 Model 9167 Are Precision Replacement Blades. 5 blades per pack. CLICK ON IMAGE AND SCROLL DOWN TO RELATED PRODUCTS FOR A LIST OF CUTTERS OR KNIVES THESE BLADES WILL FIT. 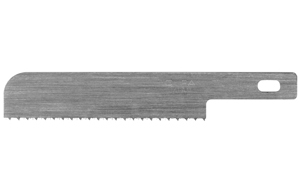 OLFA Blades KB4-WS/3 Model 9170 Are Wood Saw Replacement Blades. 3 blades per pack. CLICK ON IMAGE AND SCROLL DOWN TO RELATED PRODUCTS FOR A LIST OF CUTTERS OR KNIVES THESE BLADES WILL FIT.